Jain Pipes and Pipe Fitting are available in vast range and in various materials, Whatever be your application... We have the Piping System - that can be installed on surface, buried, slip lined, trench less, floating and submerged. Jain pipes can be used in Fluids transport include, For Lifting, Transporting, Conveying, Distributing Disposing or Tapping of Water, waste-water (drainage & sewage), compressed gases/air, odorous and corrosive gasses, chemicals and hazardous wastes/effluents. Solids conveyed include coal ash, slurries, sand and cables. Whatever we manufacture we have aligned with conservation, Water & Energy conservation and nature protection with our products like Plastic Piping Systems, Solar Water heating Systems, Micro Irrigation Systems, Food Processing and Plastic Sheets. Jain Piping Systems are manufactured in our most modern manufacturing and testing facility. Jain Irrigation today, is one of the largest polymer processors in India. 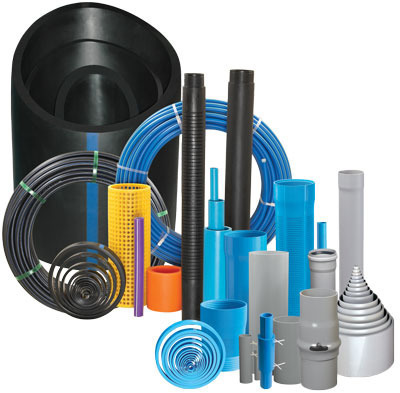 PVC, PE, PP along with Engineering Polymers like PC, PBT, Nylon, ABS, etc. totaling to over 200,000 MT are being extruded and injection moulded. We initiated our organization Saheli Enterprises, Navi Mumbai in the year 2007 as the eminent name responsible for manufacturing, wholesaling, trading and supplying a wide range of Variegated Products. The offered range of product is manufactured in our ultra-modern and well equipped infrastructure facility, by utilizing advanced production methods and supreme quality materials. Under our product gamut, we have pvc curtain, Plastic Curtain and Air Curtains meet to their diversified needs of our wide client base. We are offering this products at market leading price to our valued clients. The entire manufacturing is done in our well establish infrastructure using the upgraded assortment of machines. Our infrastructure unit has been partitioned into many departments; each department is well equipped for maintain all the business related process smooth. Our organizational structure has been kept coordinated by well qualified and experienced team members. Our in-house quality checking unit performs strict checking procedures, so that offered products to our patrons must be flawless in finish.